Every eye is riveted on the glitzy actors and actresses in their fancy costumes. And every effort is made in order to transform an ordinary theatre stage into a magical wonderland. After all, didn't the great bard once remark that "All the world is a stage and that men and women are merely actors and actresses with their own entrances and exits"? But William Shakespeare did not tell the full tale. Behind every successful actor is not only his or her performance, but also the numerous hidden men and women who work tirelessly behind the scenes, the "unseen but always present" invisible hands that keep the theatre production going like a clock in perpetual motion. Ever wondered who are behind the "invisible hands" that make each musical production work? I Theatre's Poultry Tales is a show within a show. The production centres on the work of four stage crew as they make preparations for an upcoming performance. The crew tell three stories, Chicken-Licken, The Goose That Laid The Golden Eggs, and The Little Red Hen. Chicken-Licken. A masked play where every face represents a different character. period costumes and swashbuckling action. The Little Red Hen is a musical extravaganza with "magic" in the air! 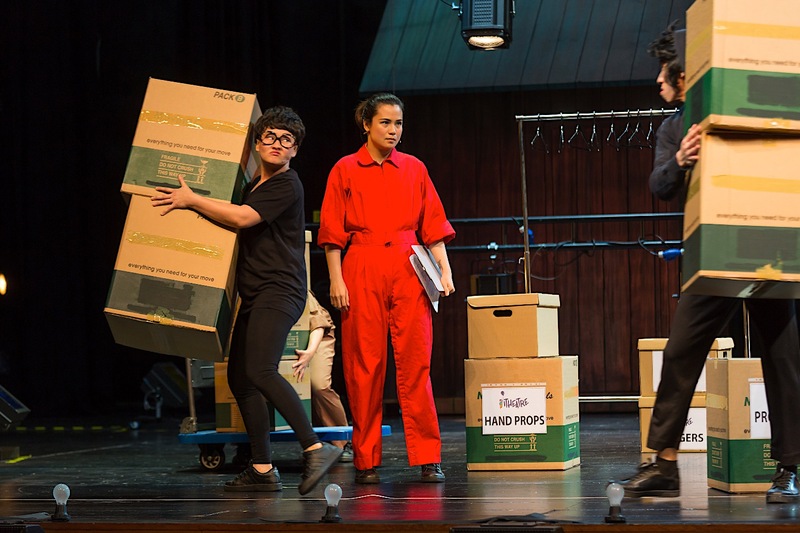 Each of the stories is separate, but I Theatre neatly strings them together through the actions of the stage crew, who take the opportunity to also share about how a theatre production is put together. For instance, the audience learns that a "hand prop" is not a "prop that is carried on the hand", but an item that is the "personal property of an actor". Similarly, the audience is also taught theatrical terms such what is a "flybar" and what are "legs". I believe this is the first children's theatre performance that provides kids with an idea of what a production is all about. 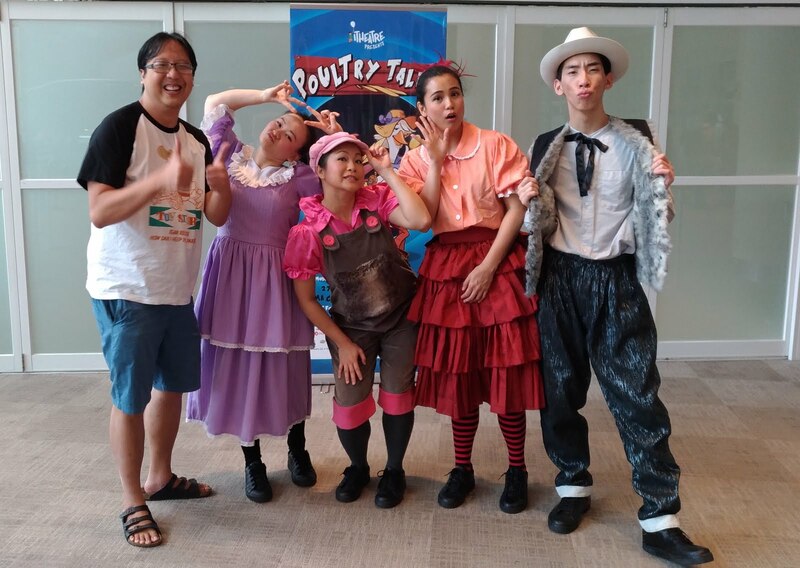 I Theatre says that in its 16 years on stage, there are many children who are keen to explore and understand what theatre is all about; and Poultry Tales chooses to answer these questions in a fun and entertaining manner. Halt who goes there! Behind every successful show is an outstanding set of stage crew. 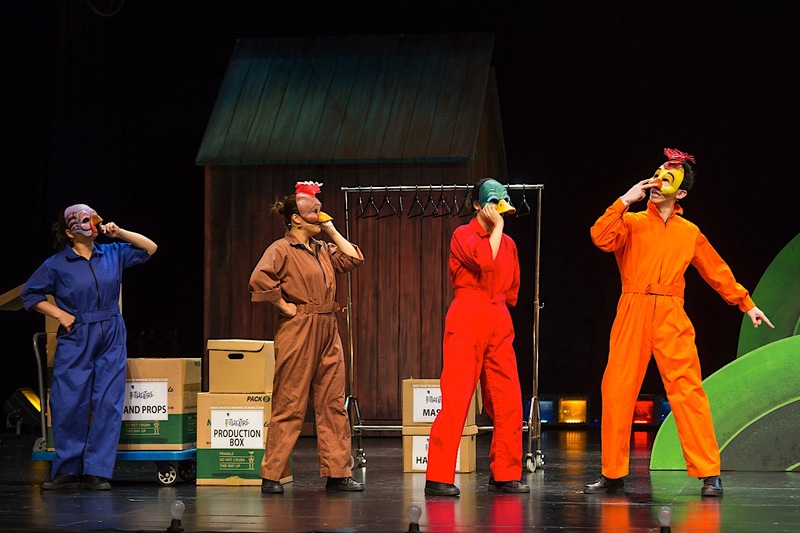 Educational aspects notwithstanding, Poultry Tales is not unlike many of the outstanding I Theatre productions we have seen. Scenery, script, music and dance all come together to create an eclectic and memorable musical sensation. For instance, the background scenery is beautiful, with houses that move and hills that roll. 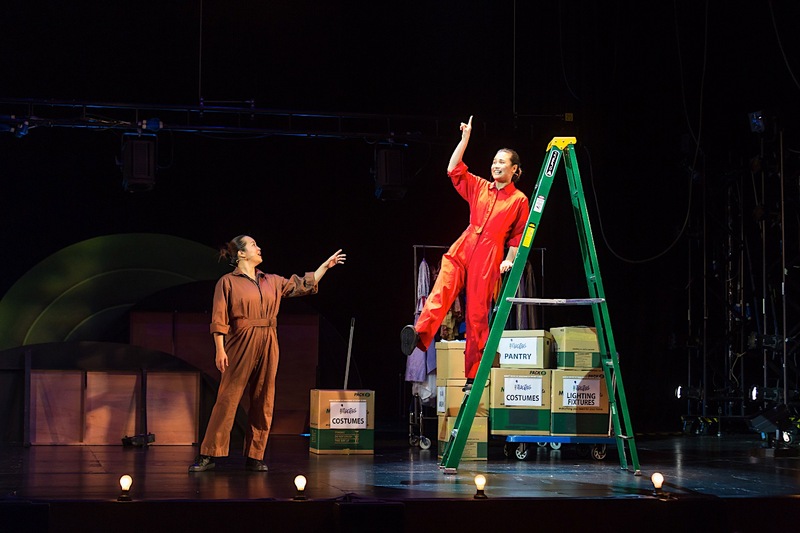 The actors are a familiar group, with Elizabeth Loh, Isabella Chiam, Daphne Ong and Darren Guo all regular names in the I Theatre circuit. As for the songs, the dynamic coupling of Bang Wenfu and Cathy Kee result in musical numbers that bring the production to life. 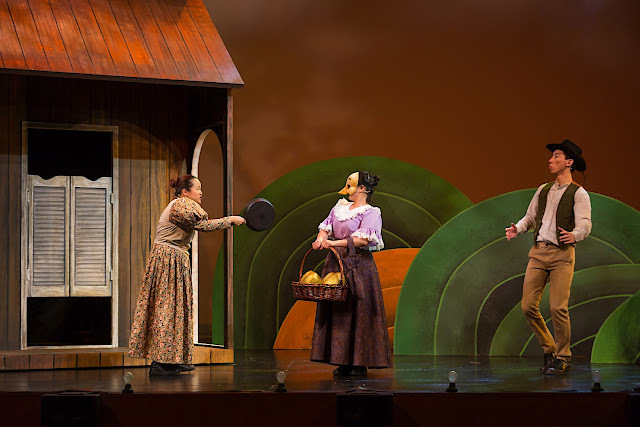 Sizzling action from the cast of Poultry Tales! At the heart of every I Theatre production is the visionary leadership of Artistic Director Brian Seward, who believes in stories with strong moral values. For Poultry Tales, Seward has embarked upon an ambitious project with a different genre for each of the three tales. 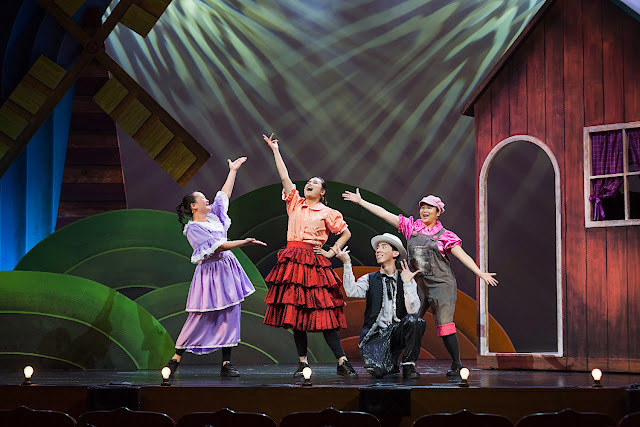 The production is also put together with sensory-friendly considerations for children who might otherwise find the theatre to be a scary place, details such as lighting that is not too dark or sound volumes that are not too loud. 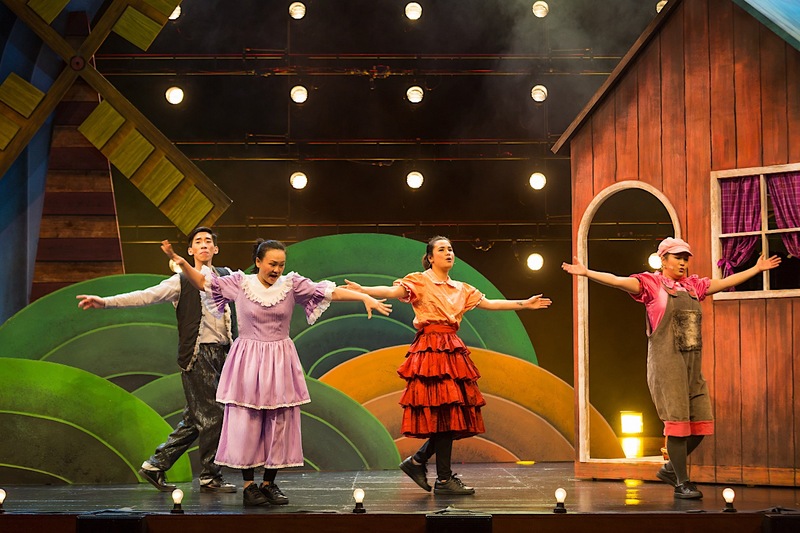 These elements result in the creation of a project that is a great hit with the children, and also rich with many theatrical elements that the kids can appreciate and enjoy.